? 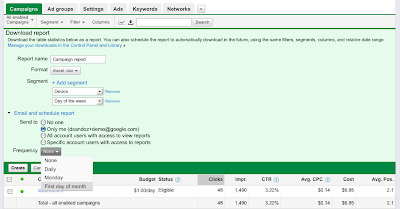 Sharing the insights you find in your AdWords reports should be as easy as forwarding a YouTube link, so we’ve recently released new options for segmenting, scheduling, and emailing the data on your Campaigns tab. By clicking the Download button in the toolbar above your data tables, you’ll open a menu that shows you a number of options for sharing reports with others. First, you’ll name your report, just as you would in the Report Center. Next, you can add segments to reveal different dimensions of your performance. Add multiple segments at once to get a even deeper breakdown of your statistics. For example, you can segment your campaigns by device and day of the week to understand the days when your customers are more likely to see your ad on their mobile devices. Each new segment you add will appear as a separate column in your downloaded report. From here, you have a few options. You can simply download your report in formats ranging from .CSV to .PDF and personally deliver it to your favorite teammate. Or, you can choose to email your data to one or all of the users with reporting access in your account. Finally, you’ll set the frequency at which you want this report to run. So if you’ve set up a filter for your keyword list to show, for example, only those keywords containing the term “free” that have cost you over $50 with a conversion rate under 5%, you can now get a weekly email with a report showing you their performance. All the reports you download from the Campaigns tab will appear in your Control Panel and Library, a new area used to manage the reports and custom alerts that you’ve created for your account. When we discover something great, our first impulse is to share it. How else do you explain the 66 million times people have watched a baby panda sneeze? 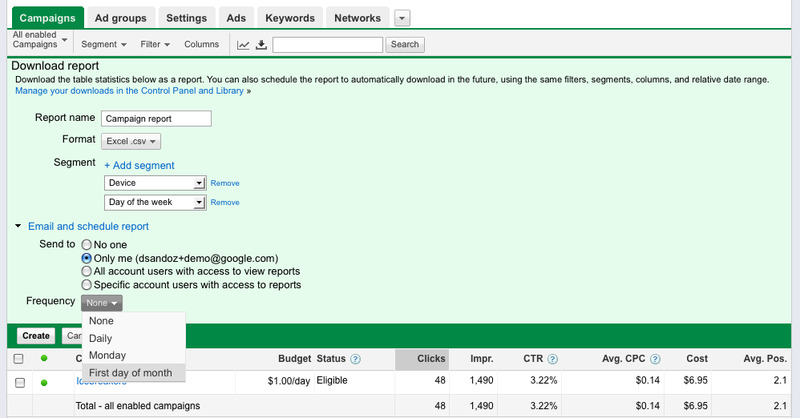 Sharing the insights you find in your AdWords reports should be as easy as forwarding a YouTube link, so we’ve recently released new options for segmenting, scheduling, and emailing the data on your Campaigns tab.